I received a sample from Godiva but all the opinions expressed are my own. To continue our discussion about savvy and culturally competent marketing, I’d like to share with you Godiva’s latest product in its ongoing marketing to Asians: the Year of the Goat gift box released just in time for Lunar New Year (also known as Chinese New Year). Each year, the limited edition packaging reflects the animal of the Chinese zodiac that is being celebrated. On February 19, 2015, the Year of the Sheep or Ram or Goat begins. The gold and red design is clearly identifiable with the Godiva brand, but adds a special twist to make it a gift that’s appropriate for the holiday. 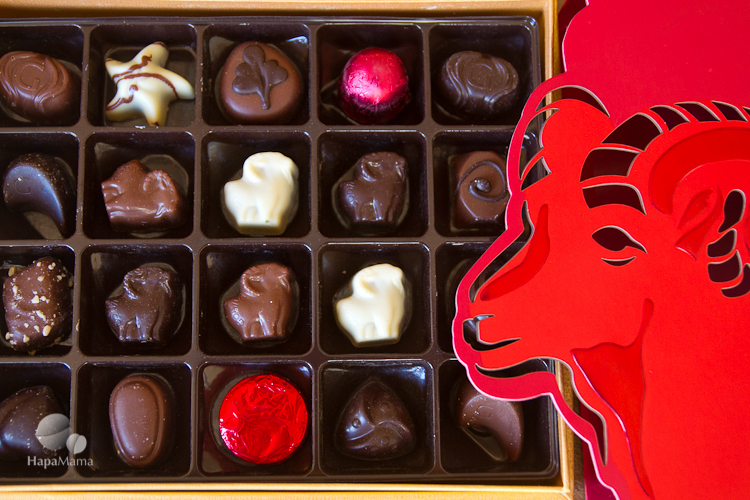 Inside, the chocolates feature a combination of Godiva’s classic Belgian chocolates, with the addition of some special candies in the shape of a goat. Inside their dark, milk, or white chocolate shells are filled with Asian-inspired fillings. This year’s assortment of chocolates is the most adventurous to date. The Year of the Goat gift boxes are available at the Godiva website for $50, and also at selected Godiva stores in areas with large Asian populations, such as Los Angeles, San Francisco, New York, Chicago, Houston and Vancouver. I think this is a great combination of a a brand’s core product marketed with a culturally appropriate twist that makes it especially appealing to overseas Asian and Asian American customers. They also offer similar sets for the Autumn Moon Festival, when Chinese people give gifts of red bean paste filled moon cakes. Some of my readers of commented that the chocolates aren’t really part of the traditional holiday menu or gift-giving. Red envelopes filled with a small (or large) amount of money are traditionally given to children and sometimes business colleagues, but in the United States sometimes people feel uncomfortable giving gifts of cash (see: business colleagues) so I think the Godiva gift boxes are an appropriate token than anyone would enjoy. This is great! Kudos to Godiva! Love this. They should also have one for each Cultural Heritage month. hahaha I guess is a marketing stunt but lets face it those are some really good chocolates! Not exactly cheap. Too bad am not in Vancouver at this time.